Bennett R. Katz | Katz & Rychik P.C. Bennett R. Katz is a founding Partner of Katz & Rychik, PC. He graduated from the State University of New York at Binghamton (B.A., Political Science 1985) and St. John’s University Law School where he was an editor of the Journal of Legal Commentary (J.D., 1989). Mr. Katz was admitted to the Bar of the State of New York in 1990 and is also admitted to the U.S. District Courts, Southern and Eastern Districts of New York. 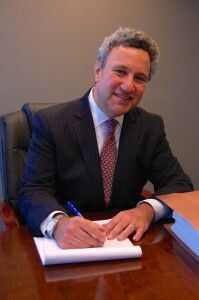 Bennett was previously a Partner at Ohrenstein & Brown LLP. Mr. Katz’s litigation practice focuses on the areas of banking, creditor’s rights, real estate and insurance defense. In addition to successfully litigating many cases in these areas, he has given presentations at the Risk Insurance Management Society and the Association of the Bar of the City of New York concerning mold liability, toxic torts, indemnification, risk management and products liability.